In early May, I was invited to participate in the symposium “The Art of Misdirection,” discussing the exhibition “Present Continuous” of Berlin-based Israeli video artist Omer Fast at the BALTIC Centre for Contemporary Art in Gateshead, UK. Many of the works exhibited here tackled issues relevant for my project on war experience, discussing the struggles of homecoming and reintegration, but also moral implications of warfare, and guilt. As the Guardian‘s review of the exhibition states, Fast’s works warn us over and over “that the world is not to be trusted.” Films like his 5000 Feet is the Best (based on Fast’s interview with a US Predator drone pilot) subvert genre conventions: they suggest ‘authenticity’ and ‘truth’ in their gestures toward the documentary mode but insert orator’s tangents and flashbacks, time loops, and obviously veer into fiction at times, making the observer wonder if the interviewees and/or the filmmaker are lying to us, and why. It didn’t help here that I recognized the actor representing the drone pilot, Denis O’Hare, from the TV series True Blood, where he played the vampire Russell Edgington, a particularly untrustworthy character. In A Tank Translated, the crew of an Israeli tank share their experience about fighting in the conflict with Palestine. Lighting, the positioning of the interviewees, the sequence of questions and answers, all suggest an oral history documentary, until the English subtitles subtly begin to take on a life of their own: words disappear or change, often altering or even contradicting the meaning of what was just said. I was fascinated and confused by this blurring of genres. My researcher self longed for the documentary mode, to be able to trust the films as sources (as far as oral history can be trusted as a historical source in the first place), and take home more information on how war experience can be narrated. Yet, I also enjoyed how the films played with the viewer, and how their rejection of genre conventions visualized not only possible renditions of traumatic war experience, but also hinted at a veteran’s struggle to talk to a stranger about his experience, the decision on whether or not to be truthful, and what repercussions one’s personal tale might have―on one’s reputation, one’s sense of self, or on the public imagination and memory of that particular conflict. The Symposium’s contributions marked a truly trans-disciplinary approach to Fast’s work. While I contextualized it with my take of milblogs as a form of ceremonial storytelling, other scholars approached it via historical perspectives on visual artists as military spies, via trauma studies in literary theory, via critical observations on militarization in urban studies, or historians’ efforts to protect cultural heritage sites in conflict zones. A few days ago, I attended this year’s meeting of historians in the GAAS in Tutzing at Lake Starnberg, southwest of Munich. The meeting’s central theme was “Auto/Biographies in American History,” which gave me an opportunity to look at milblogs from a perspective of autobiographical writing. I had worked through a number of books on Anglo Saxon war diaries and memoirs early last year, among them Samuel Hynes’s The Soldier’s Tale. I enjoyed the way Hynes discusses various war narratives’ medium and genre specifics; he develops a fascinating overview of how personal war narratives interrelate with other genres, such as historiography, travel writing, and autobiography. His observations on commonalities and differences between these text types and personal war narratives make Hynes’s work fruitful material for teaching: It explicitly invites students to engage in source criticism, e.g., by addressing that, while both travel writing and war narratives have a ‘touristic’ perspective in that they discuss foreign and exotic places and peoples, war narratives depict the radical cognitive gap between civilian and war experience, focusing on the battlefield as an “anti-landscape,” and, thus, revealing that war “is not a place we could travel to” (7-8). However, Hynes’s approach seems too narrow to do justice to the various forms of personal war narratives. He argues that war narratives “are by their nature retrospective. To perceive the changes that war has made in a man requires the passage of time and the establishment of distance from the remembered self” (4). In this and similar statements, Hynes favors the memoir over the diary or the letter as a source on personal war experience, positing that a soldier-author does not have time to reflect on war experience during the war itself and, more importantly, that it needs a post-war self to bring memories in order and create a coherent narrative of one’s war. I’ve found this emphasis on an author’s temporal distance to the actual experience of war to be problematic and used my presentation at Tutzing to discuss how milblogs, especially their technological specifics and the corresponding cultural practices of public discourse between bloggers and audience, invite and nurture dialog among soldiers and civilians and, thus, facilitate reflection on the impact of war on the self even during deployment. According to Hynes, war narratives―being a form of conversion literature―have autobiographic elements but, unlike autobiographies, they do not depict “continuous lives” and focus on war as an interruption. Veteran (memoir) authors look back on their old war selves as strangers: “For everyone except career soldiers, military service is a kind of exile from one’s own real life, a dislocation of the familiar that the mind preserves as life in another world” (7-8). However, it is worthwhile to study texts focusing on this interruption as they reveal that, indeed, reflection takes place in the war zone and that these texts convey fruitful information for historians, and literary and cultural studies scholars, as well as psychologists. A researcher’s focus on milblogs written during deployment can help explore the causes and effects of the “dislocation of the familiar” as they happen, and it illustrates the soldiers’ and civilians’ discourse on these extreme circumstances while the soldier is still embroiled in the war. As historical sources, memoirs are limited because, although their authors had time to reflect on their old war selves, they might depict selective or distorted memories, and will probably have been influenced by collective memory, i.e., by the public, interpretation of that war shaped by media and the arts. While milbloggers may not have had much time to sort out and come to terms with their experience yet, their interaction with their audience provides a public forum for reflection; this exchange, in addition to depicting personal experience, illustrates how collective memory of that event is being constructed. Public exchange on personal war experience has also begun to play a larger role in psychology in recent years. The growing focus on narrative in psychology, especially on a narrator’s interaction with a supportive and responsive audience, reveals that reflection and meaning-making may take place through narrating experience and bearing witness. Recent psychological works on war stress and PTSD suggest that research emphasis on personal war narratives may even help integrate the frequently opposed branches of cognitive/neuro-psychology and experimental social psychology. Milblogs and other social media demonstrate the role of reflection and meaning-making through social support, because they facilitate exchange between deployed soldiers and civil society. In addition, working with methods and concepts from popular culture studies, e.g., fandom studies, allows us to see milblogs as a joint effort between soldier-authors and a (mostly) civilian audience to make meaning of war experience and negotiate one’s place in US society, that is, to constitute community in an effort to create a joint narrative (for a detailed discussion, see my article “Keep that Fan Mail Coming”). Reflections on individual as well as collective impacts of war are part and parcel of the exchanges in milblogs. As such, these public debates and the social support for soldiers through interactive communication are not a new phenomenon. While Web 2.0 provides the technology to engage in such exchanges on a global scale and in almost synchronous communication (minimal time delay between narrative and response), such public debates were already observed during the US Civil War, when soldiers’ letters were widely distributed among home communities and frequently republished by local newspapers. While researching Native American veterans’ issues at Northern Arizona University in Flagstaff, I had the pleasure of seeing a presentation by Dr. Bronwyn Carlson (University of Wollongong, Australia) on 14 October. Dr. Carlson, who visited NAU to discuss collaborations between her institution and the Applied Indigenous Studies Program at NAU, specializes in the study of social media use among Australian Aboriginal communities. I am fascinated by Carlson’s work because it brings together a number of aspects I have been grappling with for my milblog project. I read the use of social media by primarily non-Indigenous populations (i.e., US soldiers and civilian representatives of the home front) as a cultural practice that conducts cultural work by ceremonially negotiating war experience and, thus, constituting community. My work draws from a discussion of how Indigenous communities in the US reintegrate returning veterans and of the role community support plays in this integration process. Media-studies approaches to social and new media in the early 2000s tended to be very defensive in stating that virtual communities, such as blog audiences or Facebook groups, could constitute community through relationship-maintaining interaction that was not bound to embodiment and place. Much of these debates seemed to defend against allegations that online communities could not be communities, exactly because they were not spatial and embodied, and often did not enable synchronous conversation (such as the sequence of blog post and readers’ comments). While my own work draws from observations about Native American war-related ceremonies to argue that non-Native milblogs, indeed, constitute community because they perform ceremonial acts of narrating war experience and social support through audience response (an indirect link between Indigenous communalism and social media), Bronwyn Carlson’s research focuses on how Australian Aboriginals directly operationalize social media for community-related cultural practices. One aspect of this would be the question of forging identity – I have been asked repeatedly in how far online space as a playground for assuming another identity might be a problem for my work on milblogs, in how far some blogs might be fakes assuming a “hero” identity In the case of veterans and soldiers, I am sure that any wannabe milbloggers would be called out very quickly because the milblogosphere so so well-connected and because the topics are so specific that faking expertise would be too difficult to succeed. However, the fact that some popular (general) blogs turned out to be based on fictitious identities, and the widespread utilization of anonymity in social media raised the question of authenticity among many colleagues to whom I presented my work. ‘Playing with identity’ seems to be primarily a problem of the “Western” world, though, if we consider Dr. Carlson’s work. Australian Aboriginals tend to be more interested in representing, emphasizing, and strengthening their cultural identity through their representation of “self” in social media, rather than engage in ethnic, social, or gender drag. Carlson’s presentation and articles illustrate that Australian Aboriginals not only use social media at higher rates than non-Indigenous Australians, but that their use of the media opportunities goes beyond typical non-Indigenous uses, as well. It incorporates culturally-specific elements that serve to (re-)instate cultural identity: Because many communities have been torn apart due to forced adoptions, residential schools, or employment requirements, many Australian Aboriginal communities face challenges in continuing particular practices, and social media offer opportunities to remedy this predicament. This is especially important regarding matters of death and mourning, which are called “Sorry Business” among Aboriginal communities. Sorry Business entails social obligations, based on reciprocity and social support, participating in ceremonies, and representing one’s extended family. Social media allows people to inform distant relatives about the death of particular community members through online obituaries, to organize transport to remote funeral ceremonies, to extend gestures of support and condolences online if attendance at a funeral is impossible, and to dedicate online sites as memorials to deceased persons, to which users can contribute by posting stories, images, or messages. I have seen similar practices and functions of bridging the spatial divide in milblog-representations of mourning, and am fascinated by the similar utilization of technology to continue cultural communal traditions between them and the expressions of Aboriginal Sorry Business. I found especially remarkable that Dr. Carlson presented this cultural phenomenon from various angles, discussing culturally-specific problems such as the impact of staggering numbers of suicides among Australian Aboriginal youth on Sorry Business in the social media, and internal debates on cultural taboos (such as visual representations and mentioning the names of deceased persons online). These perspectives complicate our understanding of the matter, yet they illustrate intriguingly how a culture is not only confronted and challenged by technological and social change, but also, how community members take up the challenge and seek to incorporate these new technologies into its cultural and social fabric. Representations of internal debates and conflicts over cultural taboos versus opportunities to conduct ceremonies and commemorate lost community members, after all, indicate that this culture is alive and kicking. A few days ago on 3rd December, I have held my last lecture on this trip. While the earlier lectures discussed my work on German perceptions of Native American cultures and promoted the forthcoming book, this talk presented some of my current work on deployed soldiers’ milblogs. 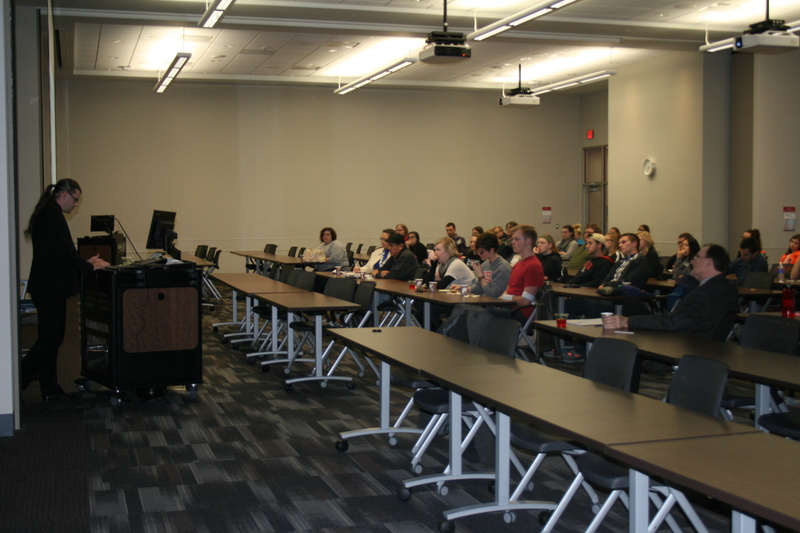 This guest lecture was hosted by University of Nebraska, Omaha’s English Department and the Office of Military and Veteran services. I met Dr. Charles Johanningsmeier, who invited me to Omaha, during his Fulbright year at American Studies Leipzig in 2007. Since then, we have kept in close contact and frequently worked together. Omaha is very dear to me, for the friends and colleagues I know here but also because this is where I held my first lecture when my dissertation project took shape in 2007. 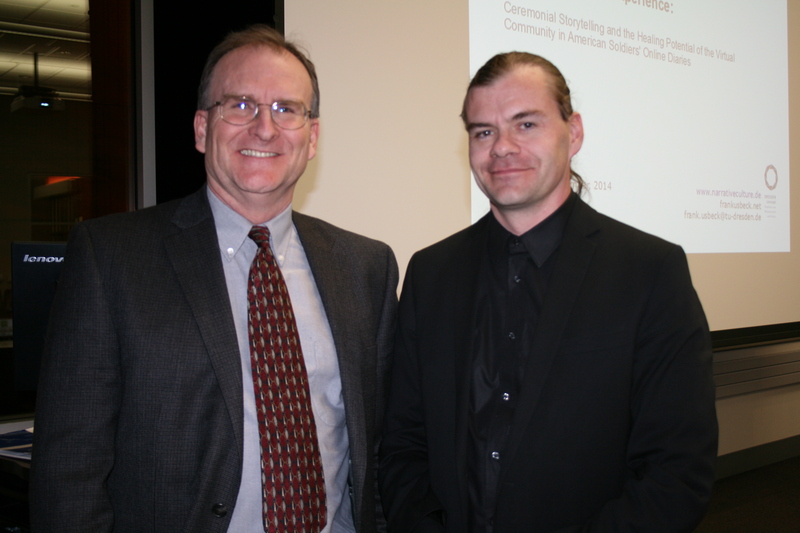 Last week’s lecture provided an overview of the interdisciplinary methodology of the project and contextualized Native American military traditions before launching into a close reading of an American soldier’s milblog from Afghanistan. I pointed out different elements of ceremonial storytelling in the interaction between deployed soldiers and civilian audience. Some of these textual elements led back to the presentation on “tribute and memorial posts” I held at the 2014 ASA convention in Los Angeles. Similar to my reflections on the longue dureé in Indianthusiasm for teaching due to the lectures on Nazis and the GDR that I held over the course of only one weekend in Oklahoma in late October, this lecture helped me approach the topic of death and mourning in milblogs from different angles, discuss it with a diverse audience, and thus extend the scope of my work from the ASA presentation in early November. This widened perspective will help me tackle another chapter of the blog project in the coming year. Apart from the academic values gained from this final lecture, it was fascinating to observe the environment in which the event took place. The lecture was held at UNO’s Community Engagement Center, a brand-new building dedicated to community outreach. The audience was thus both “gown” and “town,” comprised of students of both English and Native studies courses, veterans, and members of the Omaha community. As my colleagues told me, UNO was recently rated the best four-year college in veteran services by the Military Times. It was thus particularly interesting to observe and discuss veterans’ affairs at this institution. This also brought back discussions and observations from last year’s conferences at UC Santa Barbara and Copenhagen where many discussions and presentations centered around the question of college veteran services, student veterans, and the role of the humanities in veteran reintegration. Similar questions recurred during the last few days when I met with colleagues and representatives of veteran groups, such as The Mission Continues. The Mission Continues has recently become one of the best-known veteran support groups. They focus on community service and volunteerism as its founders have realized that many veterans are eager to continue serving and that volunteerism, i.e., helping others, helps veterans to help themselves in their efforts to reintegrate into civil society. I became interested in groups like TMC when looking at the warrior philosophy of Native American military traditions and their strong focus on ceremonialism, community relationships, and mutual aid. Native studies scholars argue that “warriorhood” is anchored in perpetual community relationships, while “soldiering” in the ‘Western’ sense is more perceived as playing a social role. The community engagement of The Mission Continues reminds me of relationships in changing tasks (from fighting to, say, charity or care-giving) known from native warrior philosophy. Since both Native scholars and military psychologists have argued that ceremonialism and community relationships might support the reintegration of non-Native veterans and could play a role in working through their traumatic experiences, I have begun looking beyond milblogs to find other non-Native efforts to implement community and ceremony in my research during this year. The Mission Continues is a very good example for such efforts. Getting together with TMC representatives as well as social sciences scholars from Washington University and Lindenwood University in the St. Louis area helped me explore these veteran groups’ efforts. Their information and advise provided valuable social science perspectives for my project. I will continue to look into this and similar projects, although they are not deployed soldiers’ narratives, to look for ceremonialism and community interaction as ingredients for reintegration. 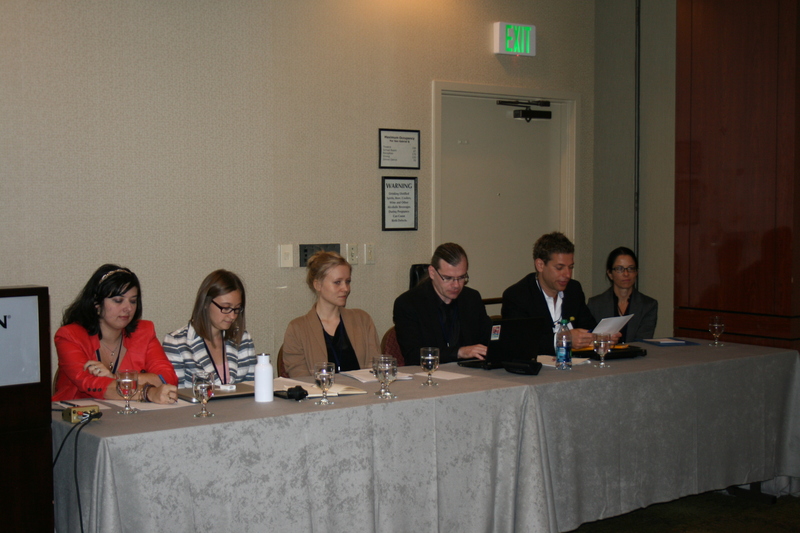 Between 6 and 9 November, I joined colleagues from Leipzig, Dresden, Albany, Wisconsin in Los Angeles to hold a workshop during this year’s American Studies Association convention. The conference was titled “The Fun and the Fury: New Dialectics of Pleasure and Pain In the Post-American Century.” Ou r workshop “Fandom and the Public Sphere: Textuality, Affect, and Social Relevance” addressed three distinct case studies of civic engagement via fan communities, i.e. how fan communities’ affect-driven activities invite civic engagement and social mobilization. Kyra Hunting and Ashley Hinck analyzed the interrelation of celebrity activism and fan engagement in Ian Somerhalder’s (The Vampire Diaries) foundation on environmentalism and animal rights, arguing that Somerhalder’s celebrity status works as an inclusive mechanism to draw people towards civic engagement and political activism who otherwise wouldn’t become involved. Alice Hofmann presented her work on Dave Eggers’s Zeitoun, a novel depicting the turmoil in New Orleans during and immediately after hurricane Katrina, as well as institutional racist practices in the treatment of people suspected to be looting. She detailed how the charges of domestic violence against the actual person Abdulrahman Zeitoun overshadowed both the book character Zeitoun and the Zeitoun Foundation’s post-Katrina charity work in New Orleans. My own presentation explored the negotiation of war experience and general civil-military relationships in milblogs addressing soldiers’ deaths and the corresponding funeral and memorial services in Afghanistan and the US. Reading the blog audience’s interaction with the authors as “fan” activities, I analyzed the debates on death in war as a deliberate attempt of civil society to uphold its end of the social contract: to provide support, understanding, and guidance for the soldiers whom civil society sent off to fight (and risk their lives) on its behalf. All three papers presented fan activities as new forms of civic engagement that, while less institutionalized than earlier forms, empowered people to become involved in political activism on an individual level, many of whom would not have been attracted to become involved via traditional channels. As some of the commenters in the workshop’s audience remarked, however, this new form of civic engagement, being “thoroughly neoliberalized,” carries the risk of remaining restricted to a mere notion of “cozy virtual likemindedness”: Affect may serve to get people to do something about a particular social problem, but will Internet-based, individualized activist communities like the ones described here have a significant effect (i.e., impact) to actually implement social and political change? In addition to wondering how efficient fan-motivated political and social activism can be (which might also be a project for the social sciences as it suggests quantification for proof, while the presenters emphasized the cultural work of these texts and practices), workshop participants raised the question at which point, if civic engagement increasingly draws on these new modes of social mobilization, “fandom becomes a proxy for democracy?” This intriguing thought should offer diverse angles of observation and analysis for cultural-studies scholars interested in the interrelation of new media technology and cultural/social practices over the next few years. Between 3 and 6 April 2014, the European Association for American Studies held its biennial conference at The Hague. I was surprised to see so many conferences on war in so many different disciplines over the last few years. This cannot simply be related to this year’s Great War anniversary, but is probably also because the recent wars in Iraq and Afghanistan have either officially ended or “Western” engagement draws to a close. In addition, the outbreaks of these wars are more than ten years in the past now which has given scholars a bit of time to reflect and connect the dots. I went to The Hague because I co-chaired a workshop on “War Narratives and Web 2.0: Justification, Storytelling and Public Discourse” with my Danish colleague Morten Braender. We developed this workshop out of observations that, in recent years, a number of European scholars have reflected on the steep rise of war narratives in the new media from various methodological angles. We brought these different approaches into dialog and opened the topic to scrutiny for a variety of disciplines relevant for American studies within both the humanities and the social sciences. Our presenters’ academic backgrounds illustrated these different angles: Johanna Roering’s work centers on media research, Morten Brænder is a political scientist, Mikkel Bruun Zangenberg teaches comparative literature, and my own work uses historical, anthropological, and cultural studies approaches. These presentations supplement were mutually supportive in addressing the common theme of public discourse by deployed soldiers in online media. The point of departure for Johanna Roering’s presentation was the shared experience of researchers within this field that studying web 2.0 technology is studying a moving object, and that scholarly conclusions about, say, early blogs from 2003 are likely to be outdated already because of the fast pace of changing information technology and corresponding cultural practices. By drawing on Henry Jenkins’s concept of ‘converging cultures,’ she demonstrated, however, that the challenges of studying the how the representation of a single person’s identity is articulated in different media (from blogs to tweets to YouTube vlogs) can be turned into an analytical advantage. Roering also explained the technological specifics and media-related aspects of a military blog, which constituted a common ground for all participants and thus further contextualized the field of research for the following presentations. Morten Brænder’s talk centered on how blogs can be used in the social sciences as a source to explore different justificatory practices. He employed the concept of “sacrificial ideology” (Hubert and Mauss (1929); Girard, Violence and the Sacred, 1979) and distinguished between the sacrifice’s ‘explicit function’ (the justification itself), and its ‘implicit function’ (to show that something is perceived as worth dying for). He argued that the explicit function of sacrifice can only be maintained as long as its implicit function is not articulated. Drawing on this conceptual framework, Braender compared how two bloggers from the same American unit in Iraq perceived the deaths of three of their colleagues in an incident on 8 February 2008 and thus, how milbloggers discuss and and make meaning of death. Mikkel Bruun Zangenberg’s presentation also emphasized the importance of justifying military action in blogs. His approach addressed that any justificatory practice articulates a particular view on justice, a view that does not cover what justice is in a genuine ethical perspective. Hence, Zangenberg illustrated in his reading of a blog featured in the New York Times how the blogger justified the war in Iraq but, at the same time, ignored the question of the civilian costs of the war by unequivocally focusing on the higher purpose of fighting terrorism. My own contribution explored the cultural work and the therapeutic potential of milblogs by comparing them to Native American ceremonial narrative practices of re-integrating war veterans into their communities. Many Native vets employ their war experience in their continuing reciprocal relationship with their communities. Similarly, the interaction between bloggers and their audience negotiates the social contract between soldiers and civil society and thus facilitates an interpretation of war experience as an asset for the community. The discussion following the presentations addressed Army censorship of online communication, identity construction in online narratives, reliability and source value in regard to the authors’ narratives and audience responses, blank spots and (mis-)representation in online communication, as well as notions of ritual and symbolism in online narratives. The conference organizers announced that they requested short reports from all workshops and will publish them on the conference website – if you are interested in the many other presentations on such topics as war and food, women at war, human rights, international law, representations of trauma etc., please check back visit either http://www.eaas2014.org or http://www.eaas.eu/conferences. I am curious about information from all the panels I missed myself.